TSUKAMOTO Etsuo works under the assumption that sculpture is an artificial recreation of natural phenomena, the act of imbuing natural objects with a human touch. Based in Hirosaki, Tsukamoto produces artworks that reflect his view of sculpture while decoding the past and present of Aomori Prefecture, which is itself a natural environment that holds many examples of human meddling. The feudal warriors of the Tsugaru clan historically bred their own variety of pet goldfish, known as the Tsugaru-nishiki, and the region’s crops have long been produced by way of human agriculture. In this year’s 17th annual Vision of Aomori exhibition, which features artists with a connection to Aomori, Tsukamoto interprets the place where artistic creation occurs as a “farm” of sorts, in which lies the perspective of a sculptor who sees the big picture behind the innately human and artistic desire for intervention into nature. 2015 “TSUGARUNISIKI in TENNESSEE” Library gallery at University of Tennessee University at Martin, USA. 2013 “Etsuo Tsukamoto – Portrait – “, Former Sanwa Kagaku Kyozai, Aomori, Japan. 2009 “Etsuo Tsukamoto – Cockscomb – “, MEGUMI OGITA GALLERY, Tokyo, Japan. 2018 “Akari no arika 15th Edge” GALLERY NOVITA, Aomori, Japan. 2018 “Hirosaki art museum3 – Collabo×Collabo×Collabo”, Mannaka Gallery, Aomori, Japan. 2017 “Akari no arika 14th Reflection”, GALLERY NOVITA, Aomori, Japan. 2016 “Hirosaki art museum Bukeyashiki×Art”Hirosaki city Nakamachi area, Aomori, Japan. 2015 “New Work From an Old Studio”, Chinretsukan Gallery of Tokyo University of the Arts, Tokyo, Japan. 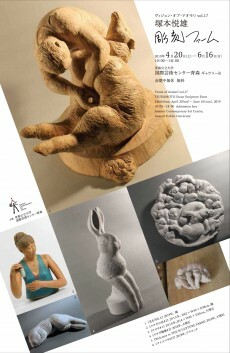 2011 “Art museum is Zoo”, Kosugi Hoan Museum of Art, Nikko, Tochigi, Japan. “XYZ”, MEGUMI OGITA GALLERY, Tokyo, Japan. 2007 “Aqua Art Miami 07”, Aqua Wynwood, USA. 2006 “”Skinodelic – Sculpture Surface – ” The University Art Museum, Tokyo University of the Arts, Tokyo, Japan.